What if we set up a free backyard traditional family style BBQ in the homeless park? No motive. No hidden agenda. No end goal in mind. This question serves as the catalyst for an inner city get together that draws hundreds every Saturday to a run down park in Cass Corridor in Midtown Detroit. (There’s actually six locations, but this one is where it all started, and the location we were able to visit.) It’s casual and non threatening, come as you are, hang as long as you like. Eat. Visit. Play. Relax. Rest. Enjoy. Refresh. Connect. Food brings people together, but backyard BBQ’s set the vibe for ease and relaxing. Comfort and casual. Inside jokes that are born out of common experiences. Laughter at the antics of the kids at play. Full bellies that eases the stress of the day. Eating and visiting under the open sky with the grass under foot. That kind of space allows people to drop their guard and be more open to connection. 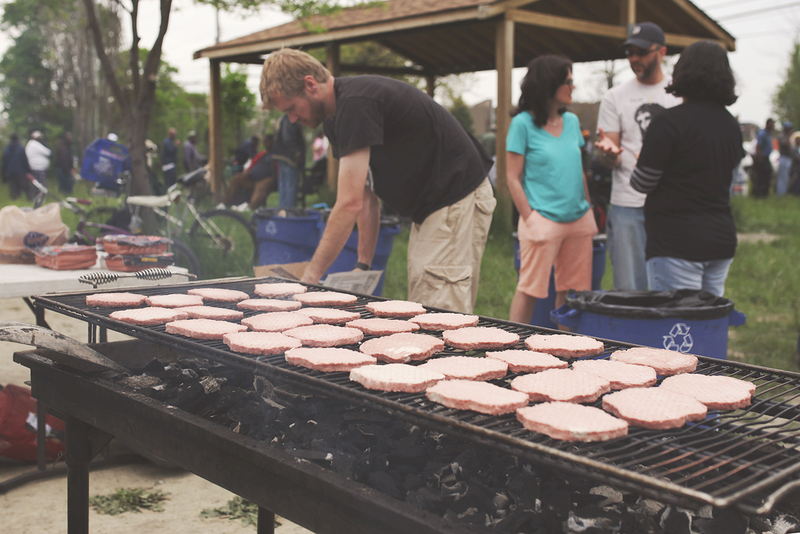 Elevate Detroit is a backyard BBQ that started nine years ago in an attempt to connect college students, churches and communities. Multiple groups host each month to reinforce the concept that we are all in this together. It honors the truth that everyone has something to contribute. Not one person or group is in charge to which they would receive credit. And in turn, the burden does not fall on one group. Many hands makes easy work. 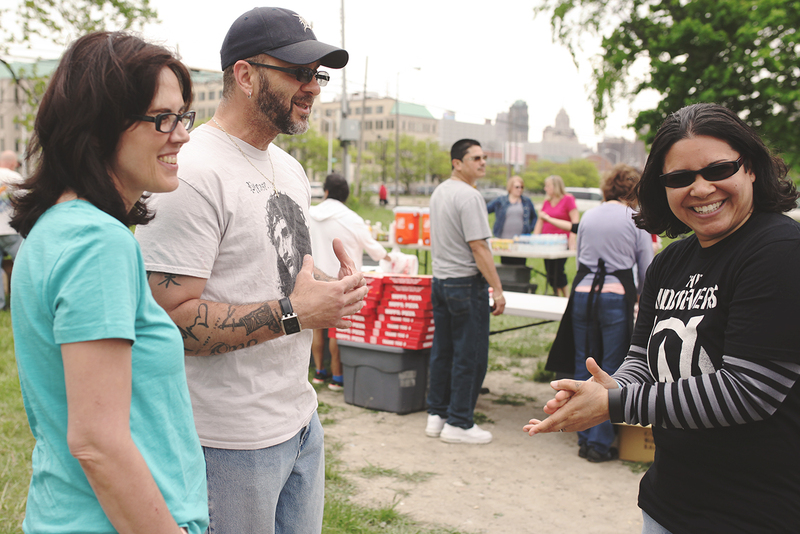 When Kat and I heard about Elevate Detroit, we were intrigued to say the least. From the website, I wasn’t quite sure what to expect. Then on Friday morning, we arranged to meet Mike at the park where the BBQ’s are hosted. Arriving it looked like almost every other park in the area that has scars of neglect, trash littered around, grass growing too tall, and picnic tables strewn about. Nothing special, nothing unique. Kat and I sat under a recently built pavilion while we watched a man hop of out his car with no shoes and come strolling towards us. Somehow we just knew this was our guy. We got to sit with Mike, who took over Elevate Detroit six months into its inception, and got to hear his passion for this project. You could see that Mike’s conviction in his faith is what takes him out into the community, yet this project isn’t a serving opportunity, nor is it a share Jesus opportunity. It is simply and irrevocably about people loving people. For more than an hour Mike shared stories with us of hundreds showing up to the event and only having food for a few, and then suddenly bags full of food were delivered by a stranger to feed the masses. Threatening storms that rolled in on BBQ days only to completely surround their part of town but not rain on the event. That in nine years, there has only been on altercation, and afterward, the homeless and neighbors in attendance came and apologized for the disturbance. Their love and devotion to this picnic making them protective of everyone who comes, needing desperately to make sure their tradition continues. This BBQ has become such a signature of this area that Elevate doesn’t promote it anymore. Everyone just knows to show up. As empty and nondescript, bland and normal as the park was on Friday, when we came back on Saturday, it transformed into a thriving, living, and electric community. Food and music, games and laughter were the heartbeat of the park. Clothes were laid out on tables for the taking. The grass was mowed, tables set up, food was in bounty with kids and adults playing games. Life was blooming in this park, surrounded by traffic, asphalt, and boarded up buildings. It is the heart of community. Coming together. Trusting one another. Sharing with one another. It is of the most divine work to show up without expectation and be present in the lives of those who suffer and need. This is the heart of Elevate Detroit, and we are inspired by their ability to love and care without wanting anything in return. It is time to show up. Time to love. Time to not want anything in return. Time to be present in the lives of others. Time to care for those who need us. Time to step outside of our comfort zone. 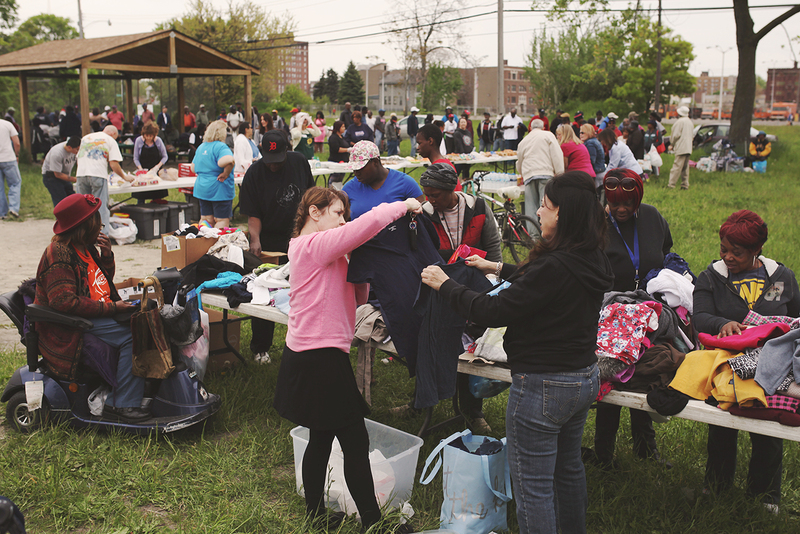 Thank you Elevate Detroit for being an example of how we can show up and stay faithful to the natural way community creates itself in the desperate need of survival. So how do we do this in Minneapolis (or Saint Louis Park) Kat? I don’t think I could do it myself, just too many other things to plan. It would probably take finding a local official that would be up to spreading the word and then finding a few sponsors (but they would have to donate from the heart, not be looking for publicity). We would need to find a park where people who are homeless or in need would have easy access too and then it just takes a lot of people with a lot of heart being consistent and showing up. I know they’ve branched Elevate to a few other cities, we could always connect with Mike and see what he suggests. This is the main website, I’d love to see an Elevate Minneapolis happen!! !